Van Rompuy was put forward for the president’s job by Sweden’s Prime Minister Fredrik Reinfeldt who chaired Thursday’s summit, diplomats said. 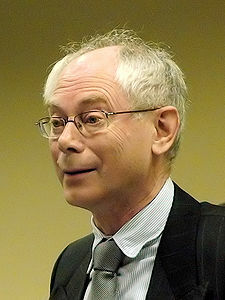 Herman Van Rompuy essentially is an economist that supports reducing government deficits and who wants Europe to preserve its “Christian” values. He is a Catholic and graduated from a Catholic university. “Turkey is not a part of Europe and will never be part of Europe. An expansion of the EU to include Turkey cannot be considered as just another expansion as in the past,” he said. So, there may be deepening divide between the EU and Islam. This does not mean that there will not be cooperation of any kind between Europe and Muslim nations, only that the leadership of the EU is letting the world know that religion will likely be something that separates the EU from others. This will prove to be more important when a religious military leader will rise up in Europe with signs and lying wonders and who professes to believe in a changed religion that he will claim as ‘Catholic’. And while I do NOT believe that Herman Van Rompuy (nor Tony Blair nor Catherine Ashton) is likely to be the one that is the final King of the North, he may (inadvertently apparently) help set the stage for that leader to rise up. 2012 and the Rise of the Secret Sect This is a link related to a book by Bob Thiel (COGwriter). This also has YouTube videos related to 2012. The book is for those truly interested in understanding how prophecies inter-relate and who want to see a real sequence of end time events. It goes into details concerning prophecies that involve the rising up of a European power, including the King of the North/the Beast and the Antichrist that line up with biblical prophecies. It analyzes others that involve the USA, UK, Canada, Australia, New Zealand, Russia, and Asia. This entry was posted on Thursday, November 19th, 2009 at 1:01 pm	and is filed under Religious News.